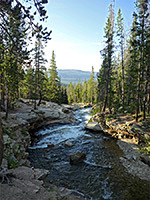 The Uinta Mountains extend for 100 miles across northeast Utah and a small part of northwest Colorado, bordered by the Wasatch Range to the west, the Uinta Basin to the south, the Green River to the east and other mountains to the north, in Wyoming. 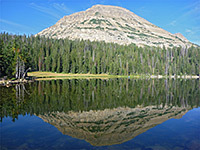 Although relatively compact, with a long, narrow ridgeline, the mountains are notable for containing the highest summit in the state (13,528 foot King's Peak), for having an unusually large area of land above the treeline, for being one of the few US ranges aligned east-west rather than north-south, and for the great number of lakes, over 2,000. 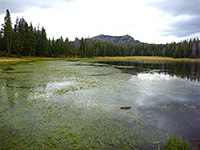 The majority occur in rocky basins close to the crest, surrounded by meadows, and are the source of many streams that flow down through the thick forest that covers the lower elevations. One of the most beautiful of such areas, relatively easily reached, is Naturalist Basin. Most visitation is confined to a narrow corridor towards the west of the mountains, along Mirror Lake Highway, UT 150 (see map), the only route across the crest, and also the highest paved road in Utah; along here are many campsites, picnic areas, viewpoints and trailheads. Apart from this there are several dozen other major trailheads, at the end of narrow, dead end, mostly unpaved roads, approaching from the south or the north, but from these, the high country is anything from 10 to 20 miles away, so most places need overnight trips to reach. 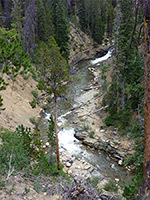 The mountains, beside being part of the Wasatch-Cache and Ashley national forests are further protected as the High Uintas Wilderness Area. The Uintas are part of the great Rocky Mountains, but unlike most of that range the rocks are sedimentary, albeit somewhat modified by compression and faulting; the layered structure is very evident in the treeless high country. Most of the exposed cliffs are grey or reddish in color, a mix of quartzite and thick-bedded sandstone, all slightly inclined. The Uintas are generally smooth-sided above the treeline, forming plateaus and basins separated by bands of cliffs, and are perhaps a little less spectacular than some better known US mountains, lacking jagged ridges and big expanses of exposed rock. Glaciers carved the basins and shaped the peaks, but today there is no permanent ice anywhere in the range, due to the prevailing warmer and drier climate; although the winter snowfall is heavy, especially towards the west, all melts by July. The highest and most rugged regions are in the center of the range, either side of King's Peak, but the crest is continuous for over 50 miles, and the only major pass through the mountains is towards the west, formed by forks of the Provo and Bear rivers, which provide a course for highway 150. The eastern end of the mountains is a little less rugged, but also more accessible, with several summits and basins within reach of day hikes, along roads starting from Vernal and Whiterocks. UT 150 (Mirror Lake Highway), the main access to the Uintas, is often rather busy on the south side, to a little way beyond the crest, but less so further north, towards Wyoming. All parked vehicles along the road need to display a USFS pass (cost $3) but primitive camping is allowed for no further payment, either in designated sites or at large, anywhere in the forest. There are many official campgrounds, with some facilities, where a fee is charged. The road starts in the west at Kamas, and very soon enters the Wasatch-Cache National Forest, following Beaver Creek, past several campsites, then crossing over to the wider valley of the Provo River, which stays fairly level for several miles but eventually turns north and gains height rather more. The scenery becomes more dramatic, as the valley sides steepen. 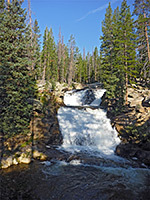 Besides picnic areas and campgrounds, the road passes two overlooks, one of Slate River Gorge, an enclosed section of the river, the other of a waterfall and cascade (Provo River Falls). 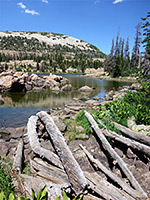 As the highway nears 10,000 feet it comes close to various lakes, some the site of campgrounds and/or trailheads, including Trial, Washington, Crystal, Lost, Teapot and Lilly, before reaching a high point at 10,715 foot Bald Mountain Pass. 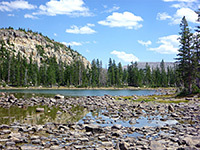 The namesake mountain, close by to the north, is the easiest Uinta summit to climb, and the only one with a maintained trail. Next are several other lakes - Moosehorn, Pass (start of the popular Lofty Lake Loop), Tadpole, Bonnie, Butterfly, Bud and, the largest, Mirror, which is the main center for recreation on the highway, offering facilities of large carpark, a picnic area, boat launch, campground and trailhead. The highway is now bordered by high mountains on both sides, especially east, where a great curving ridge extends north and south, rising to summits including Mount Agassiz (12,248 feet) and Hayden Peak (12,479 feet). The road now begins a long descent down the straight valley of the Hayden Fork of the Bear River, passing generally less of interest. 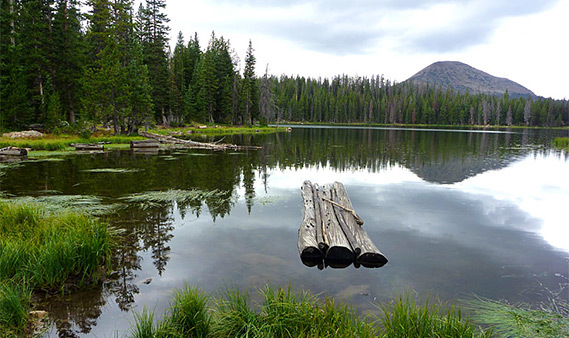 It exits the national forest 20 miles beyond Mirror Lake and reaches Evanston, Wyoming after 45 miles. 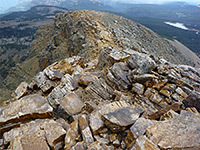 The most popular summit hike in the mountains, easily reached from Hwy 150 - by a steep but popular trail over mostly treeless slopes.